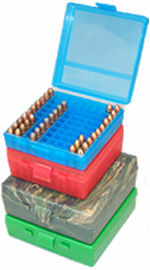 CASE-GARD� P-100 Series Fliptop handgun ammo boxes that hold 100 rounds. This is the perfect ammo carrier for the handgunner who wants to spend several hours at the range. All four sizes have easy to grip textured surface. They are stackable and come with a load label. 4 Colors: Wild Camo(09), Green (10), Clear-Blue (24), Clear-Red (29).